Common assessments are the "essential engine of continuous improvement" (Mike Schmoker). 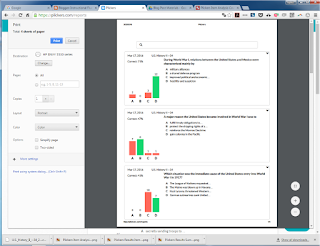 They provide achievement data about common curriculum used by teachers to discuss how to improve instruction. Although they can be seen as teaching to a test, the practice can also be understood as a way to consistently assess a common curriculum from one classroom to another. This is crucial if teaching and learning are to be the focus of a culture of learning and perpetual self-improvement. When it comes to the logistics of collaborating and sharing, management of files can take many forms. With cloud computing at the disposal of every educator, this process doesn't need to be so messy. 1. Convert exams to Google Docs. Many teachers have exams in Microsoft Word format. 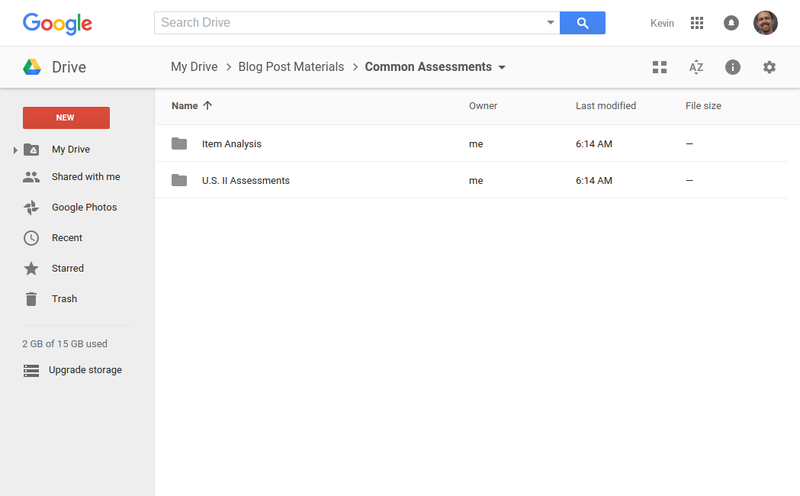 These files can be converted to Google Docs format once they are uploaded to Drive. The only trouble I've experienced in this conversion process is with tabs, fonts, and other styles. Docs is getting better with this issue, but I still clear formatting on my Word docs before converting. If the stylizing is limited on the original document, don't worry about it. If the conversion is messy, you could also clear formatting in Docs. 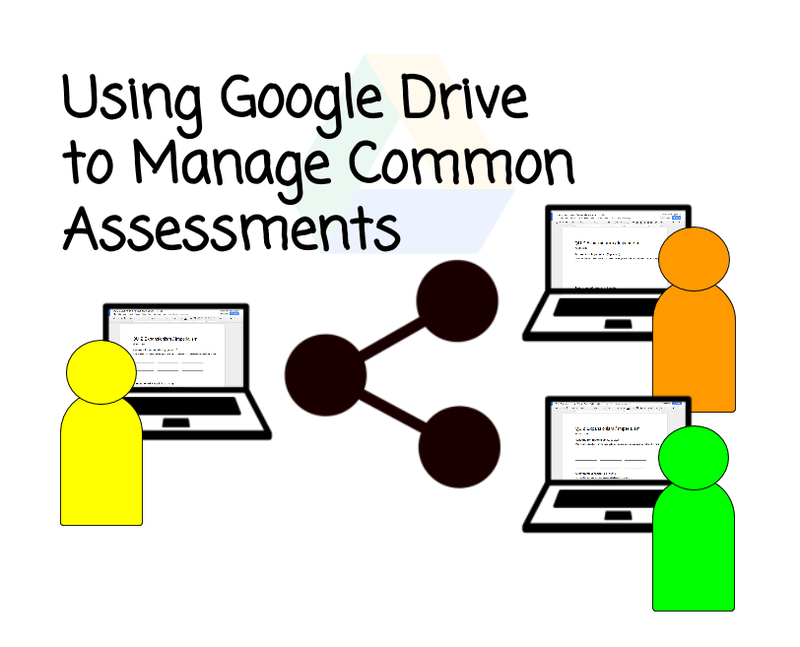 Once the assessment is converted to Docs, it is ready to be shared with course partners and anyone else with a stake in the common assessment program. All you need to do is figure out how the documents will be shared and organized. 2. Share folders with editing rights. I like to use folders to organize documents. The nice thing about using folders in Drive is the ability to set permissions for documents within the folder. This means whatever document goes into the folder will have the same permissions. In other words, the permissions don't have to be set every time a document is moved or created in a folder. 3. Edit exams in one place. How many meetings have you conducted using Google Drive? You will find that there is little reliance on an overhead projector, tasks are completed in the moment, and, most importantly, team members can take on specific roles that best utilize their strengths. For example, if my strength is searching the Internet, I may be tasked with embedding links to resources in the team's documents. It's not so efficient without online word processing. The Word file is edited by one person, and it's emailed to course partners. The next year comes and there are two different versions of the file. This issue is compounded by the two new teachers in the department and old teachers assigned to new courses. It can become a mess. It can become a lot of work to make sure everyone deletes the old version and uploads the one. This disconnected Microsoft Office approach may not sound bad in this description, so add the stress that educators carry from day to day as they complete hundreds of important tasks. Eliminate some of these potentially frustrating conditions by using online word processing and file sharing, and you'll experience more productivity -- teachers doing more for their students. 4. Make comments prior to meetings. The comment tool is one of the best time-savers. Let's say a teacher hands out an assessment and a student catches and error or has a question about the clarity of a question. How great would it be to make a comment on the Doc that can be reviewed during the next common planning meeting? I can't tell you how many times I've seen the same mistake come up with the next year (or semester) because the document (Word) was't fixed. Perhaps a team member has an idea about something in related to the current topic of discussion. As the meeting is progressing through a topic, a quick comment can be made to make note of the idea. How often do good ideas get left behind in an effort to not get off topic? Use the comment tool to backchannel either before or during the meeting. 5. PDF the exam to be administered, and label it with a date. 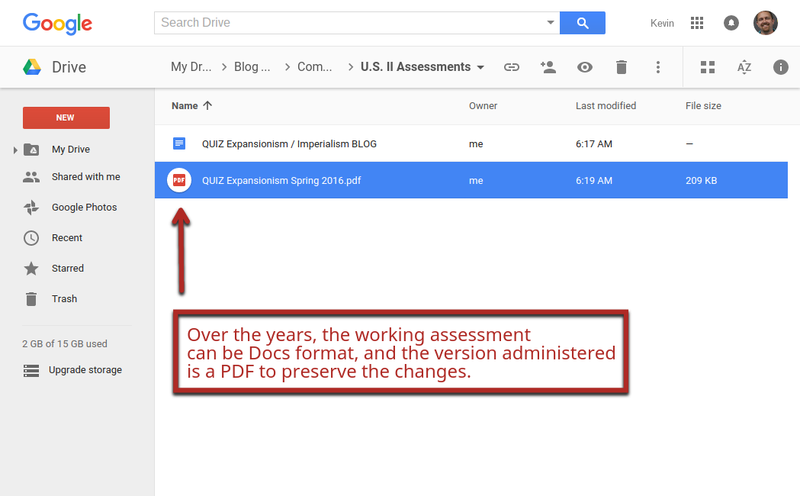 When the team decides on a version of an assessment, making a PDF can help keep a record of the versions over the years. It also secures the changes and signifies that editing has ended, until next time. Although the document creation date will be included in the PDF meta data, it helps to label each document with the date. 6. Make a folder to share student work (and data). The purpose of common assessments is to provide a basis of ongoing conversation about teaching and learning. They provide data that can be compared on a regular basis. Furthermore, common assessments create a culture of collaboration and exchange that makes schools better for kids via the strength of the faculty's teams. 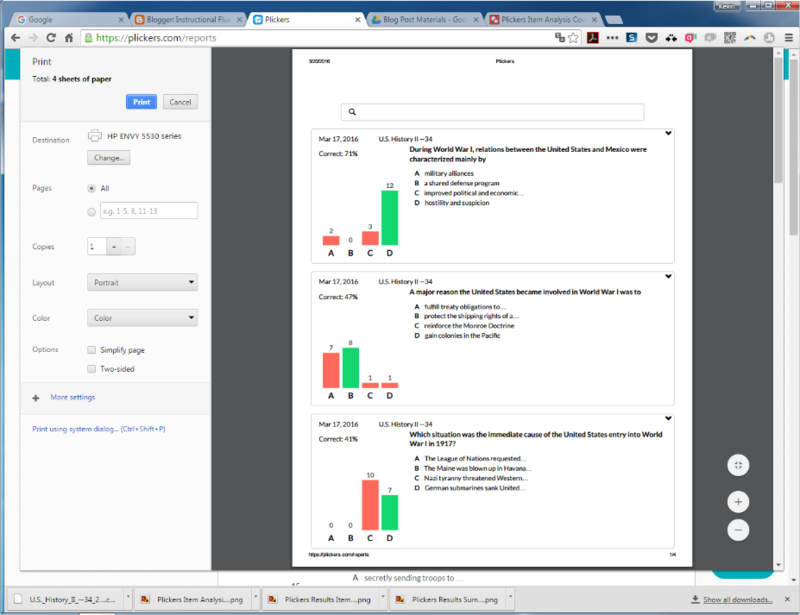 Some of the items that may find their way into a folder in Drive include student work samples, spreadsheets of data from a computer response system, narratives of student achievement, or student self-evaluations, to name a few. I’m a proponent of Chromebooks because of the lack of maintenance needed and the speed and ease of use. This is not to say that full version laptops and desktops do not have a place in schools. I’m only suggesting that we all think about how many tasks we complete on software that can run online versus the software that requires a full system. Exceptions may include classes that do video or sound editing, computer-aided drafting and design (CADD), or use the Adobe suite. For the majority of students -- the majority of the time -- Chromebooks are sufficient to complete a school day’s tasks. I suppose Microsoft OneDrive could do the job, but it’s more trouble than it’s worth. 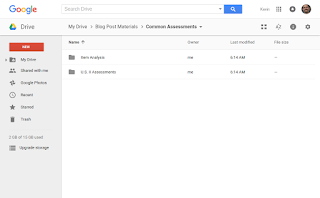 Google Drive and the Apps suite is faster and more reliable. If I transferred to a school that used Microsoft, however, I would accept OneDrive if there was no interest in Google Apps For Education. I like Google, but I ultimately like what online word processing and document sharing does for collaboration. Around this time last year, George Couros (@gcouros) started a weekly video response slow chat under the hashtag #EduIn30. I loved the idea and participated almost every week. I found myself having to really choose what to say and what to leave out because using video exposed my weaknesses as a speaker (I didn't post the worst ones). This led to a greater fluency while speaking in front of groups. It was this personal growth that I wanted others, especially my students, to experience. It reminded me of oral presentations, only more efficient for improvement. I call it #HistoryIn30. 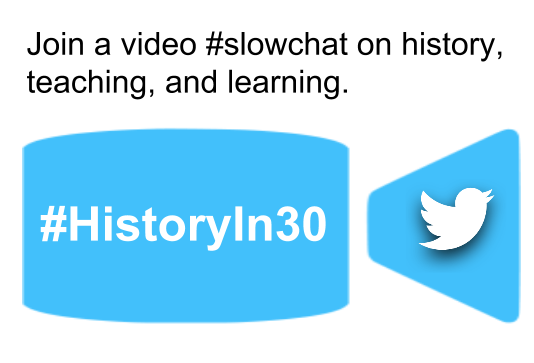 Like #EduIn30, this slow chat has weekly topics for about 10-15 weeks. 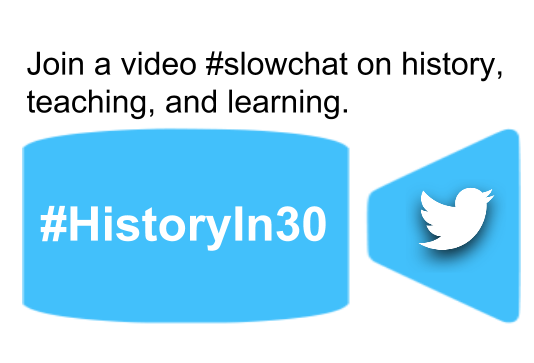 Each response is dual tagged with #HistoryIn30 and the weekly hashtag #HistoryIn30w1, for example. The dual tags will help with organization as the week's carry on. This slow chat is not limited to educators. I originally thought it would be great for kids either with a classroom Twitter account or a teenager's personal account (check no photo, no video lists, of course). Furthermore, it does not always have to be a response to the weekly slow chat. 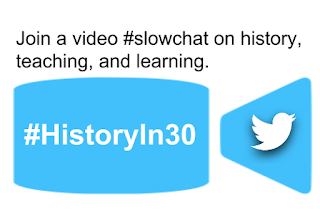 Just use the single hashtag #HistoryIn30 for random shares and reflections on new ideas, student work, or anything related to history, teaching, or learning. Video communication brings a new level of connection to our professional development and our classrooms. Let's get connected and dissolve the walls among us. 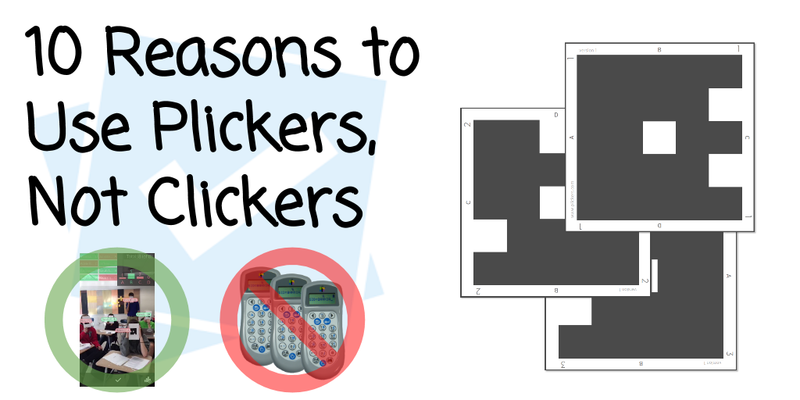 Collecting responses from students with clickers was never appealing to me. I guess it was managing more software and hardware that turned me off. With all of the Web tools coming out, the thought of changing batteries and dealing with an already slow PC, trying to update, was never on my wish list. Patience and high expectations for technology led me to Plickers. 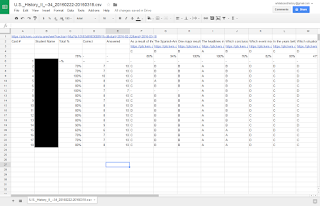 I was looking for something simple yet provided all of the data I needed to make instructional decisions. It includes Web access to set up classes, make questions, and manage data. It also has many functions on the app, which is the business end of the data collection. Plickers is easy to use and only requires one smart device, so browse these features and play with it a little. Some of these are GIFs, so keep watching if you missed what happens -- it'll play it again, and again. My first classes were all typed individually. I was so excited that it didn't matter. Once the novelty wore off, however, it was nice to see the update that included a class roster upload. I simply copy the roster from my grade book and paste it in Plickers. After a few settings are selected, the class is complete. The remaining task is to organize the cards accordingly. Some teachers hand out the cards once, and the students are responsible for the card. I prefer to laminate the cards and use one set for all of my classes. This means the student card assignments are based on the seating chart. To reassign card numbers, click, hold, and drag the card number to drop wherever you want it. I often start by transferring the assessment items by copying and pasting from the quizzes I've developed over the years. The only time there's extra work is when transferring from PDF to Plickers. Sometimes the spacing does not copy and paste correctly, which is not an issue with Plickers. Questions can be organized by folders in the library. They can also be added with the mobile app. Sometimes we take the Plickers outside on a nice day, which means students must listen more attentively. Students actually do not do worse when listening to the question versus reading it. Lastly, the questions can also be added to the library with the Plickers mobile app (second image). 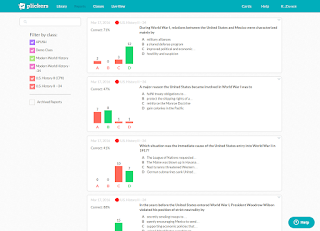 Once you've added a question (or more), it's a couple of clicks to add questions to one or more classes. This is one of the few ways to stay organized in the library, and it's just as easy to remove a question from a class. It's rather intuitive. You'll see. Plickers is a great tool to use during early stages of a lesson. It's during these stages that the process of building meaning requires more visuals to make connections with prior knowledge and make new knowledge. Adding images is quick and easy, and the images change size as font sizes are adjusted in live view (see below). The questions can be added to the queue on the website or the app. This makes it easier to maintain a certain flow for instruction. Each class can have a different queue, and questions are removed automatically once scanning is complete. The live view is perfect for displaying with a projector. The kids can read the question and see the results once they are revealed. 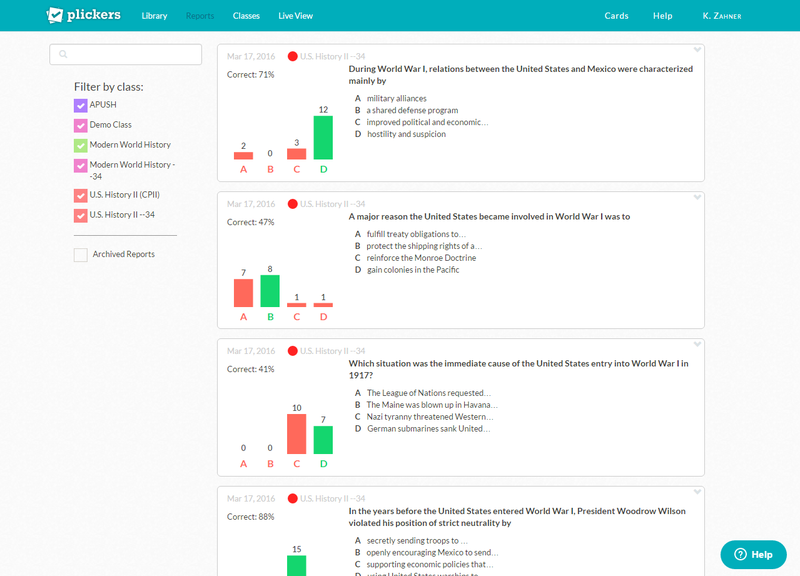 The question displayed in the Live View is controlled by the question selected with the smart device used to scan the class for student responses. Notice how the questions can be zoomed in or out to change the view. For example, if not all of the choices are visible, the question font size can be reduced to bring all choices into view. As the smart device is used to scan the class's responses, the results are displayed on the app. This includes the names and individual choices, which can be scrolled through to view the entire list while using the app. It's intuitive. If you want it to do something, it probably can. My favorite thing about Plickers is the simplicity when it comes to design. 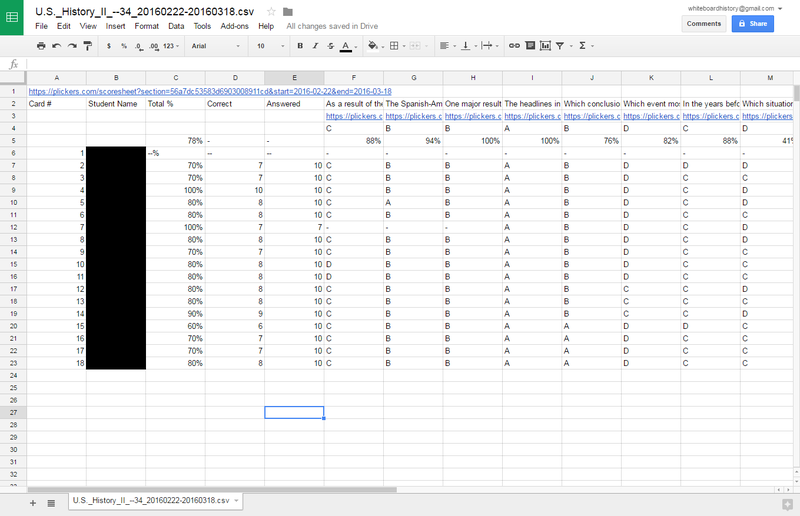 The results are displayed by question, distribution of responses (graph), and the individual choices. This feature is new, and I'm excited about it because of the patterns that it can reveal about student progress. It's what classrooms are looking for in the "age of assessment." The results are easily printable or saved as a PDF (right click and select print). They can also be exported to a CSV file, which can be opened by Excel or Sheets. Why would we use any of these technologies? I guess the better question is: When? Using Plickers during a lecture / discussion, as opposed to at the end, breaks up the input / output forms for learners. This integration of assessment threaded throughout a presentation of new information promotes more questions on the metacognitive level, which, in my experience, has led to higher achievement levels and more learner confidence at the end of a lesson or unit of study. 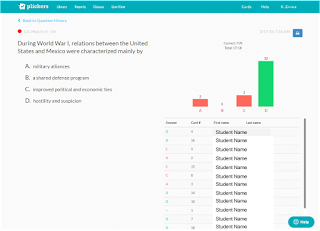 We could use other tools, such as Socrative (which has it’s own powerful strengths), but Plickers gets learners out of the glowing box routine and active with a simple manipulative. It’s not super kinesthetic, but there’s more movement that engages students in the physical learning space than a response system that lives in the virtual world. In broader context, the balance of a 21st Century classroom relies on the strategic use of digital versus non-digital tools and learning materials. Extended reading, in my opinion, is best done with paper, for example. Essay writing, however, is better practiced with an online word processor like Google Docs because of the organizational accommodations of editing without cross outs and the collaborative possibilities, as if a virtual window allows me to see learners progressing during the writing process, not just at the end. 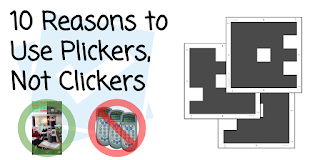 Plickers is a paper-digital hybrid that epitomizes some of the balance that a 21st Century classroom needs to support learners on their educational journeys. Update the website. Share materials with students. Transfer parts of the unit plan to Moodle or Edmodo. It's easy to get exhausted when managing too many tech tools. Technology is engaging – we love all of the bells and whistles. But there comes a time when educators have to reflect on the efficiency of the tools they use. They have to ask tough questions that may leave them taking a few steps back to decide just how much is enough. My family and I recently made a big move from Texas to Massachusetts. Among other challenges along our path, we chose to take the opportunity to shed some things that were beginning to take over our time. This mission continued for me as I set up a new classroom with new kids, a different curriculum, and a variety of technology choices. The most important technology choice criterion, for me, was how much time it took me away from working with my students and spending time with family and friends. 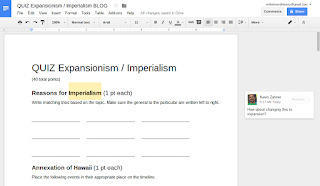 Google Docs prevailed over the multitude of options for its simplicity and sophistication. Curriculum and lesson planning often starts on a word processing document. Whether you use Word or Docs, it’s where the pieces come together and the teaching and learning is scripted. Generally, these guides are printed for dissemination to students or other stakeholders, and the usefulness is limited to a few possibilities. The resources are posted on a teacher website or blog, and the students and teachers have to take more steps to get organized. Then, the teacher notices a mistake on the website. A link is broken or it’s the wrong lesson materials. Fixing an error like this one often entails opening an html editor and completing several more clicks, types, and scrolls before the material flow is consistent with the printed lesson guide. Not to mention the confusion caused by errors in the printed document. This is exhausting just telling the short version of this drama that educators know too well. 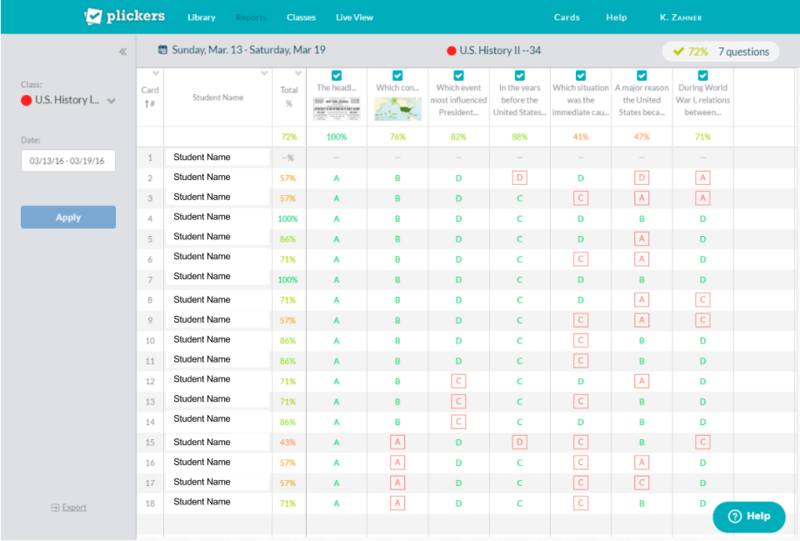 Imagine the tedious work of keeping your website and teacher-to-student communication platform up to date with the lesson guide changes. It's unreasonable to think that this process is the best use of a teacher’s time. Google Docs can be used in such a way that reduces a lot of these steps and limits the places where resources are accessed. I’m all about doing the work in one place: the doc. Don’t get me wrong. I love Moodle and Google Sites for all their neat tricks and wizardry. But I’d rather spend time providing feedback and building relationships with my students, colleagues, parents, and anyone else who has a stake in a child’s education. 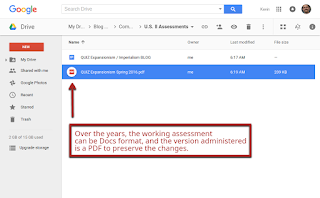 The nice thing about using apps in the cloud like Google Docs is the ability to share the document and know that recipients will always have the most up-to-date version. This concept is changing the possibilities of what can be done with online word processors. Unfortunately, I took the busy and tiring route -- via websites and learning management systems -- to discover how the cloud could make planning and sharing so simple. Here are the general steps I take to make an interactive unit guide (also see video below). Paste the standards-based content from the district curriculum document. 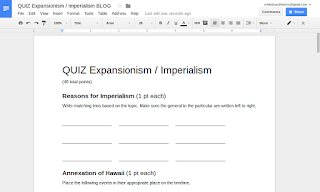 Insert tables to organize the sections for each unit topic. 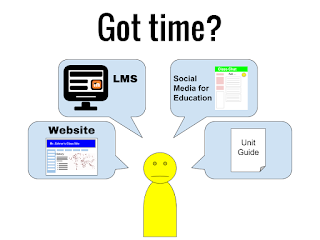 The activities and homework sections include hyperlinks to resources stored in Google Drive. 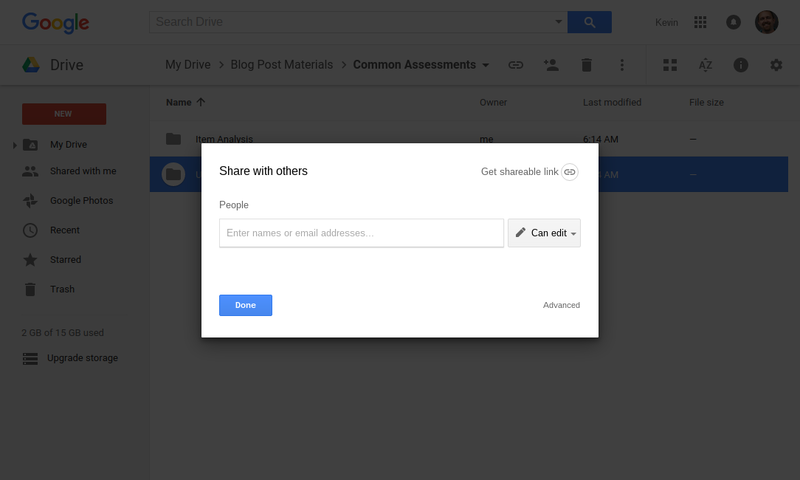 Share the link to the Doc on Google Classroom or post a link on a teacher website, to name a couple of examples. Once the doc is ready to share, users have options. Perhaps you want share a PDF to ensure recipients access a particular version. 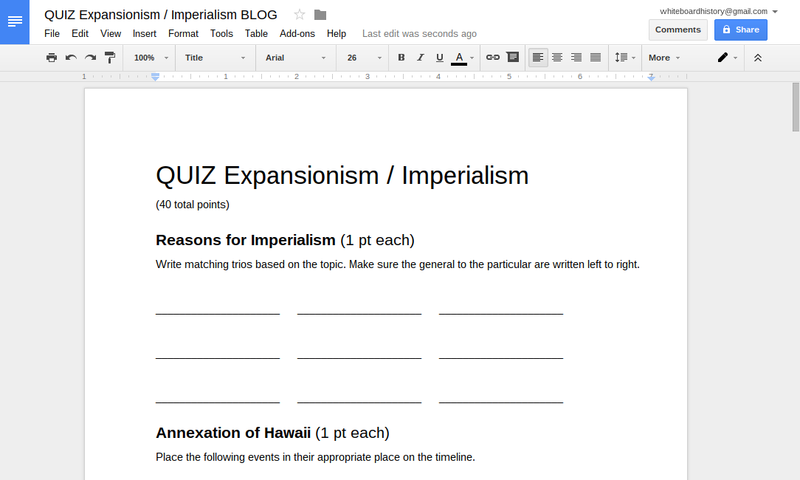 The links will work the sames as in the Google Doc format. 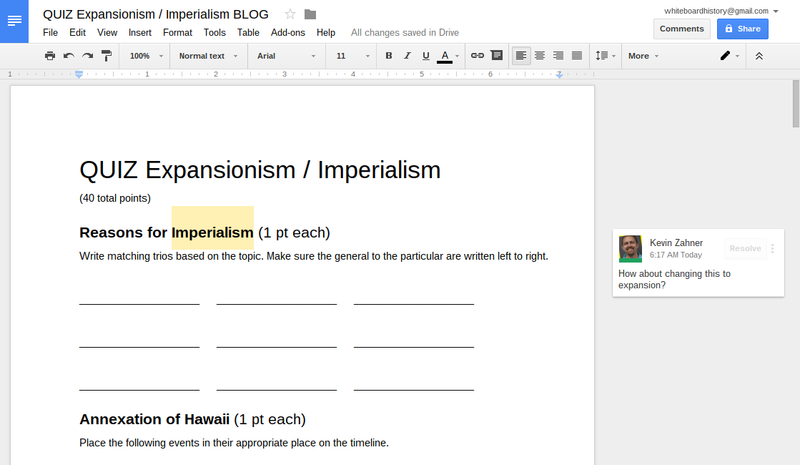 For another example, the interactive Google Doc can be shared with PLC members for ongoing collaboration. What’s More With Google Docs? Organize a doc with the table of contents tool. One doc for one class. Use a table to organize writing spaces for every student. Edit images and insert original drawings without leaving Docs. Google search and look up words without leaving Docs. Use the comment tool to communicate with students (includes email notifications). The chat tool can be used as a virtual help desk (available on shared docs). I’m not advocating a universal design for the use of educational technology. That would take away choices for teachers and students. This approach simply asks the question: How much time is being spent on managing information? Technology’s complexity is supposed to take on a load of work to increase our productivity and efficiency. When it stops working for you, you’re working for it. Avoid this trap by choosing tools that keep it simple without sacrificing sophistication. The other day, a kid said, "Mr. Zahner, your Google Classroom is money." I don't know exactly what that means, so I thanked him before the giggles ensued. Reflecting on my day, I thought about how the student's comment made it sound like Classroom is becoming routine on our campus. 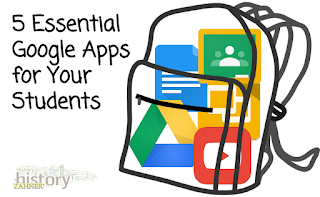 This got me thinking about the troubles many teachers have experienced trying to use Google Apps for Education (GAFE) in their classrooms as well as how much easier it has become to implement as students become more familiar with the functions and potential. It's been a roller coaster over the past three years, however. GAFE has come a long way with several hiccups on the path to its current state, which is considerably more stable than last year. The trouble comes when new users are impatient and unaware of the nature of the updates. Luckily, as I've said, the app updates are less disruptive to our routines, these days. 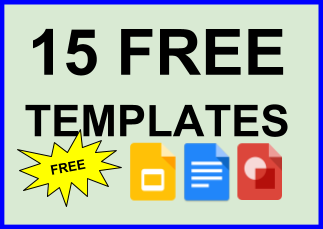 This year, I noticed that most of my students have Google Docs and Drive on their mobile devices – a few have Slides. They had no problem installing the Classroom app, and, of course, they all had YouTube. I didn't even ask. Students coming to me with Google App experience is amazing. 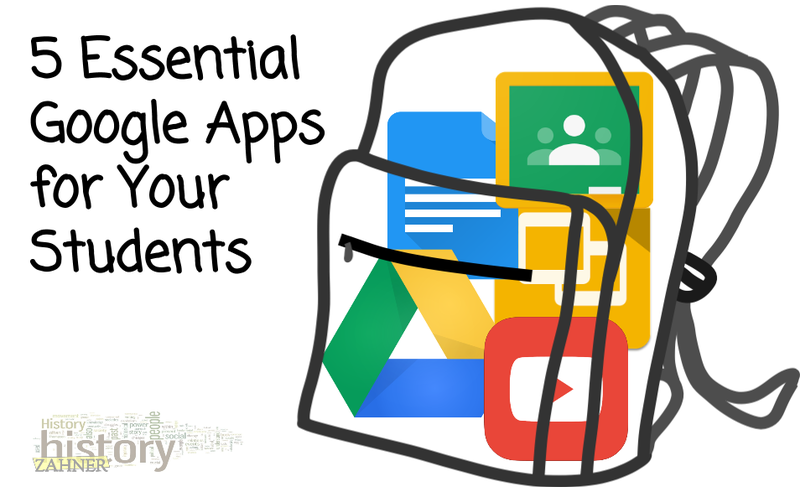 Here are 5 essential apps for mobile GAFE. The fancy apps and Web tools can easily distract us from the purpose and product, the true outcome of a lesson. Docs is an app that can put everyone on the same page, literally. Look at what my students and I did with collaborative note-taking. Pacing is one of the hardest things to manage during a lesson. It's not the pace of each learner, as if there were one pace for everyone and every topic. 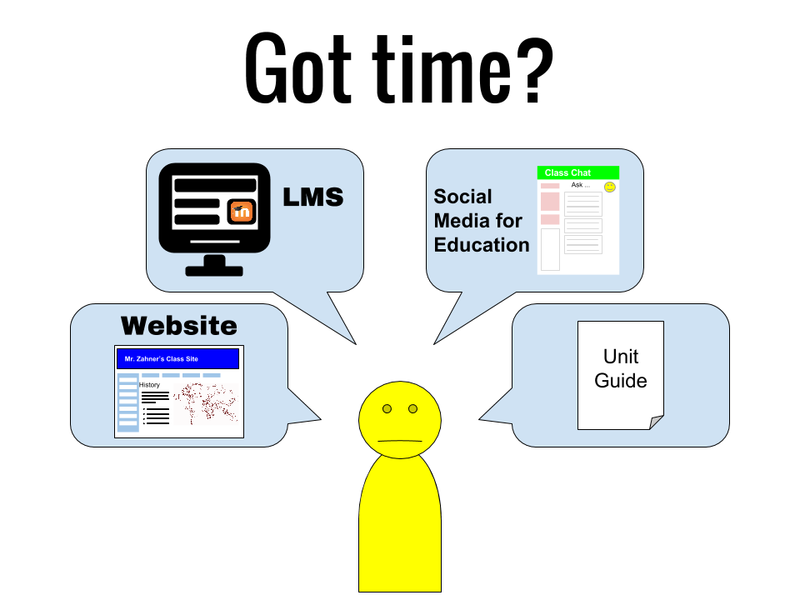 Each learner needs more or less time on different topics. To overcome this issue, many of my students keep the Slides open on their app while I flip through it on the screen. This affords them the time to slow down and catch up as needed. Here are few more things you can do with Slides. Google Classroom is your front end. It's communication, material dissemination, and assignment and feedback management. It's all of these and more. My favorite tool has been the Question. It allows me to collect a constructed response, assign a grade, and provide actionable feedback. Maybe you'll recognize some of these routines. If Classroom is the front end, Google Drive is the back. It's the hub for sharing work and can be a powerful tool for collaborative activities. 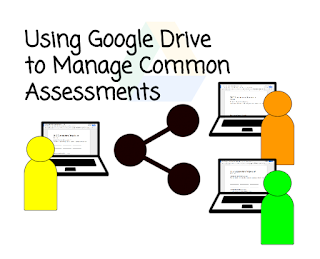 Crowdsourcing with Google Drive can be a a great way to change up the classroom content flow. It gives the kids the keys to the class. All of the videos that I use in class are saved to a class playlist. Like the file sharing folder link, the playlist is shared by link in the "About" section of Classroom. Whether it's a video that I made or another that I've selected (some of which come from student choice), the sound, visual, and ability to pause, rewind, and fast forward are things that are hard to do within the traditional direct instruction model. YouTube has been around for a while, so be careful that you don't take it for granted because it's not the flashy new app with all the wizardry.